Southwest Florida Real Estate Market is Heating Up. 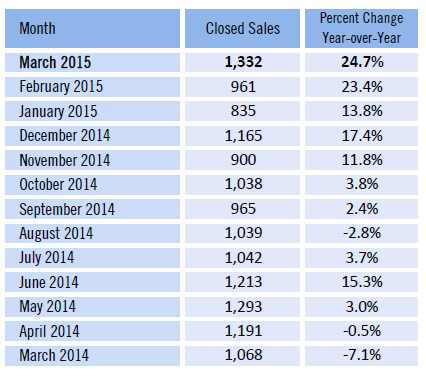 Closed sales in March were up 24.7% over last year despite lower inventory levels. Single family inventory levels were down 9.8% and yet we saw a big jump in closed sales. We’re tracking pending sales and they’re also up 7.9% which means closed sales in the coming months should also be strong. So what is different this year in 2015 versus last year? Money has really come into the market. If you’ve been reading this column the past several years we’ve been telling people our market is healing, but it won’t be fully healed until money and capital fully return to the market. 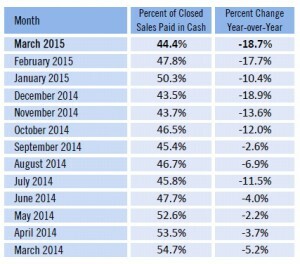 For many years cash sales drove this market at the bottom of the market. Investors and people with money were able to take advantage of a depressed market. We had a market that was artificially too low and was below replacement cost. The builders couldn’t build at a loss. This is all changing now and we’ve entered a new growth stage of the market. Lenders have begun to lend again and this is what ultimately fuels a market. When you only have cash buyers you don’t ever have a fully valued market. The same is true in the stock market, banking, currency exchanges, and economies. This is one reason countries like Russia and virtually every country in the world seeks capital investment, to spur their economy. Leverage and capital is the fuel that drives growth. SW Florida is receiving some fuel right now and that’s a good thing. 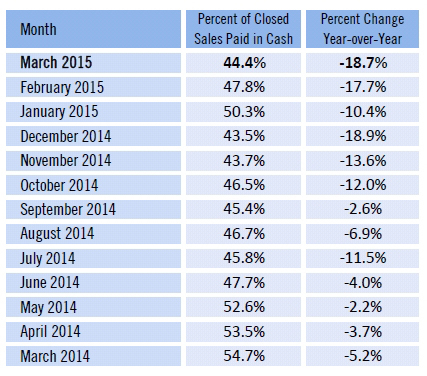 In fact, 44.4% of all single family transactions are bought as cash is still on the high side. There is room for the lenders to really come in here and propel this cycle. Lending and availability of money is a good thing. Some are afraid that lending will bring a return of the over-spending days like we had before the bust. The availability of capital we had back in 2005 was not good because anybody could obtain credit regardless of their ability to repay. The underlying assets were overvalued and the borrower was on shaky ground. It all crumbled as it was built on a house of cards. This time is different. We don’t have thousands of homes built with no end user in sight. In fact, we have a shortage of homes for the end users. We don’t have speculators flipping to another speculator who may wish to flip to yet another flipper. We have end users. We have buyers and we have actual tenants who need a home to live in. So now that we have users, we have demand, we have little supply, and we have financing options, we have growth and opportunity. These are healthy signs and I’m happy the way this market has come back and done so in a reasonable and sustainable way. Financing is the facilitator to growth. SW Florida appears to have several more good years of opportunity and sustainable growth ahead. Buyers can find properties but they need to know where to look. Our website www.Topagent.com is a good first step, but sitting down with a buyer specialist is even more crucial because often times we know about product that isn’t in the MLS. New construction is available too, and it pays to have someone who knows the product and the process walk you through that. If you’re a seller, the stars are aligned for you right now. To get top dollar it pays to work with an agent who understands the market and can guide you through contracts, pricing, and how to get financing for your property. There are options available but you have to know which one will work for your home and it can be complicated. If you’re in the market to buy or sell, our website is a good resource. However, we suggest you give us a call and we can sit down in a relaxed atmosphere and put all the pieces of the puzzle together for you. Posted in Cape Coral, Cape Coral Real Estate, Fort Myers, Fort Myers Real Estate, Southwest Florida Real Estate.Tagged Southwest Florida Real Estate Market is Heating Up.